When we moved into our old house the previous owners left behind an old (antique?) armoire in one of the two bedrooms. I loved it. And I thought it was so kind of them to leave it for us—until we realized, while moving into our current house, that the reason they didn’t take it with them wasn’t, most likely, to be kind but because it was almost impossible to get it down the very steep and narrow staircase. I was at my parents’ house, with our 3-month-old boys and Sophie, while Andy, Andy’s mom and my dad were with the movers at our old house. Andy called me, asking if I really wanted the armoire. It was easy to say yes, in the comfort of my parents’ home. It ended up in our new house, lifted with curse words, strained muscles and scrapes to the paint on the wall. It didn’t fit in our bedroom so we put it in the boys’ bedroom. Given that their changing table was also a dresser with drawers, the armoire was not needed. 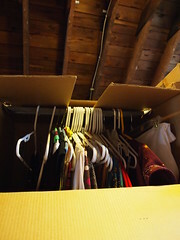 And given that my closet has no place to hang dresses, I used the armoire for my longer-length clothes. And then, we moved the boys to twin beds. We took the changing table out but kept the armoire—Andy refuses to move it again. With no other place to put the boys’ clothes, I had to move my dresses. This should, honestly, frustrate me more than it does. But mostly, I find it humorous. We moved the boys into their beds about a month ago. I have been up to the attic zero times to retrieve a dress. I’m not in a dress-wearing stage of life right now. This was painfully obvious to me today, when the children and I met Andy for lunch. I picked him up on the side of the road, outside his office building. We went to one of the downtown Skyline restaurants. The place was filled with suits, dress shirts, heels and scarves. Our kids were the only children in the restaurant the entire time we were there. I had gone to a yoga class. I had to pick Sophie up from preschool and I didn’t have time to change. I was wearing yoga pants, a T-shirt and sweatshirt, my hair up in a messy ponytail, and I was surrounded by women who clearly blowed out their hair that morning, applied lipstick, were rocking beautiful suede boots. It’s a life I once knew. And although I’m happy, sometimes I wish mothering and heels went more hand in hand. I think about when this house was built. I think about the women, mothers, who lived in it. I think about where they stored their clothes—several items, I’m sure, compared to the on-clearance-having-a-bad-day-special-occasion-oh-but-it’s-so-cute gluttony of clothes currently in my closet. I think about the decades, and styles, that have passed. Where did the women store their hats? Their gloves? Their boots? And purses! Where, in this tiny closet of mine in this “master” bedroom did they store their purses? Sophie asked why I was putting “all my pretty clothes” in the attic. “To make room,” I said. For the “creakings, rustlings and sighings” of this old house. For this beautiful, exasperating life of mine. This entry was written by kara, posted on January 9, 2013 at 12:21 am, filed under All and tagged armoire, attic, bedroom, closet, dresses, Edith Wharton, house, James, motherhood, old house, Owen, twin beds. Bookmark the permalink. Follow any comments here with the RSS feed for this post. Post a comment or leave a trackback: Trackback URL.